We See Blue Skies Ahead!! 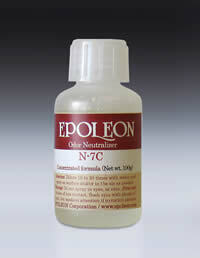 "Epoleon Odor Neutralizers that control odors in an environmentally responsible and enhancing way! As we see it, you are looking for a way of controlling odors that works as safely as it does effectively. Using progressive technology, Epoleon Corporation has met this challenge in the development of a superior product line of organic odor neutralizers. Our formulas offer a revolutionary alternative to the use of masking agents. Epoleon concentrated water-based products are comprised of organic, environmentally friendly and biodegradable compounds. Each formula is designed to chemically react, to varying degrees, with particular types of gases and is available in fragrant or fragrance free formulas. 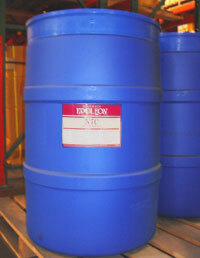 Epoleon was introduced a revolutionary approach in Landfill, Wastewater Treatment, Sludge odors. Unlike masking agents, Epoleon odor neutralizers chemically convert odor-producing gases into non-odorous, non-toxic compounds so the source of odor is eliminated, not simply covered over. Epoleon provides the most scientifically advanced odor neutralizers on the market. Epoleon odor neutralizers are able to react upon such a wide variety of gases to give you the most through results possible. Epoleon is totally organic, biodegradable and water soluble. Out concentrated liquid formulas are also offered with or without a fragrance. A diluted N-11-87 solution can be incorporated into a perimeter fogging system or manually sprayed over the surface of the landfill. N-11-87 should be applied regularly in order to effectively reduce odors and prevent ensuing complaints from neighbors. An exact agenda is ultimately left for the end user to determine, based on the weather conditions such as wind direction and temperature. 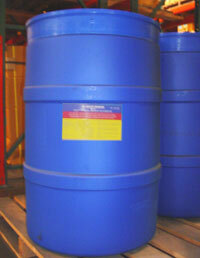 A diluted N-11-87 solution can also be used at transfer stations or to wash transportation vehicles. N-11-87 can be sprayed at full concentration or diluted up to 200 times with water. 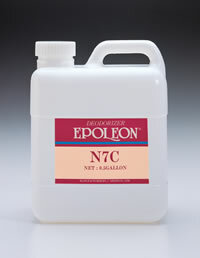 To maintain optimal conditions, Epoleon should be applied daily or regularly either by using an automatic drip system or by manually pouring Epoleon N-7C into the wastewater entrance area where there is the most turbulence. Consistent use of Epoleon will prevent the production of new gases as well as combat aging gases so, considerably less and less Epoleon concentrate will be required to maintain optimal conditions over time. The dosage rate may vary with fluctuating gas levels. Very small amount of N-7C should be poured into the wastewater continuously and/or diluted N-7C should be sprayed over the surface of wastewater for an immediate but temporary remedy. N-7C can be diluted up to 50 times with water. Epoleon can be sprayed directly into digester tanks, over the surface of sludge as it’s transported to drying beds, or during dehydration. Manual spraying of a diluted Epoleon solution is effective but for best results, we recommend using an automatic fogger or misting system, one which would regulate frequency and dilution rates. Using a higher level of Epoleon concentrate in an atomizer or fogging system will yield quicker results with less moisture. For indoor applications, Epoleon can be used at full concentration with less frequency than outdoor applications. Epoleon can also be used during sludge transportation. Dilute and spray Epoleon over the sludge after it has been loaded onto trucks to control odors during travel. Once the truck has been unloaded, a diluted Epoleon solution can be used to rinse the bed of the truck to remove any residual sludge odors. 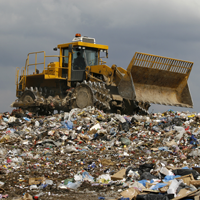 Epoleon N-11-87 offers a new alternative for controlling air-borne landfill odor, sludge odor, sewage odor, composting odor and other similar odors.